Not to be defined by any one genre, international artist, Linda Richichi, has one constant theme through all of her work: She invites us to join her and be awakened. Frame after frame, paintings and pastels offer their voices, filling the room with a cacophony of sound. Linda’s exhibitions stand in amazing witness to her intensity. Canvasses line the walls – moments translated into energetic colors. Throughout the body of her work, Linda masterly orates a variety of subjects: landscapes are alive and incarnate, lively abstracts in her Transformation Collection celebrate life’s joyous process, and each painting in the Wellness Collection encourages us to fully claim our healing power. For galleries hosting “Far and Near Horizons” click on “World Tour Artist” at www.LindaRichichi.com. Linda Richichi has exhibited extensively, including the prestigious National Arts Club in New York. Her work is in private, public, government and museum collections around the world, as well as many corporate collections. It is featured in several healing centers, with an entire collection located in the Rowley Birthing Center of Orange Regional Medical Center in the Hudson Valley of New York. She was featured in the International Artist Magazine in 2005, under Master Painters of the World. Each work by Linda Richichi is its own universe and part of a larger truth. To own a collection or even one painting is to partake in a meditation of the possible and to participate fully in Linda Richichi’s passion. She is represented by Fieldstone Fine Art in Ramsey, New Jersey, Bau Gallery in Beacon, NY, Woodwalk Gallery, Egg Harbor, WI and Icehouse Gallery, McIntosh, FL or you may visit her website at www.LindaRichichi.com. Richeson 75 International Artist Choice 2008- Published in 2008 book. Orange County Art Federation, Washingtonville, Sugarloaf, NY - BEST OF SHOW -2001, 2000. 18 artists from 5 countries exhibiting around North America, Canada and in Italy in the works. Exchange at Stewart Airport in 2005. – From Dennis Wepman, Art Curator of Karpeles Museum. 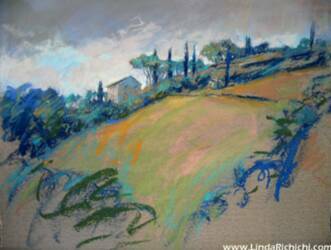 Award winning artist Linda Richichi was born in Montgomery, NY. Her educational background includes a Bachelor’s Degree in Fine Art from SUNY New Paltz and years of study with many modern masters. In 1999 Richichi received a scholarship from the Pastel Society of America to attend the Art Students League in New York City. 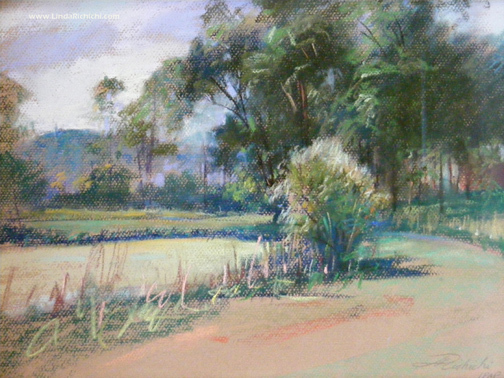 She was included in the International Artist Magazine under Master Painters of the World, Pastel Showcase in the Jan. 2005 issue and the American Artist Magazine in June 2010. In the June 2006 issue, Linda’s exhibit at the RiverWinds Gallery was critiqued favorably and written up by art critic Raymond J. Steiner, ART TIMES. In Sept. 2006 Richichi was awarded the Best of Show Ontario Purchase Award, at the International Plein Air Painters (I.P.A.P.) Fourth Worldwide Paint Out at Niagara Falls, Ontario, Canada. The award winning painting now hangs in the Niagara Falls, Ontario, Canada City Hall. Richichi has exhibited extensively including the prestigious National Arts Club in New York City with the Pastel Society of America, a solo exhibit at the Karpeles Library Manuscript Museum in Newburgh, NY, Bau Gallery in Beacon, NY and in 2011at UU Gallery in Rock Tavern, NY. Her work has traveled recently around the US and Canada. 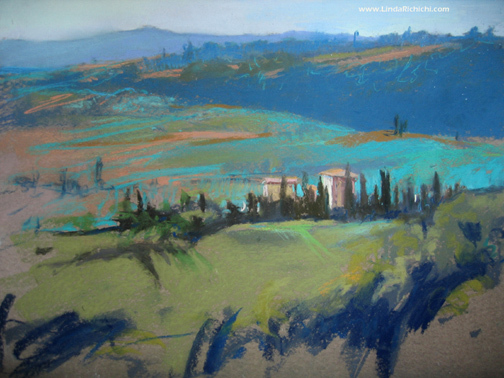 Linda often attends national invitational plein air events. Her work is in private and corporate collections internationally. She was commissioned by Mercedes Benz Corporation and the Rowley Birthing Center at Orange Regional Medical Center in Middletown, NY commissioned Richichi for an entire collection. Her work had traveled with the World Tour Exhibition titled “Far and Near Horizons” which included work of 20 Contemporary Landscape Artists selected from the International Plein Air Painters and the Landscape Artists InternationaI organizations. Richichi was the artist - in - residence at the SUNY Orange at the Newburgh Extension in 2008. Richichi conducts workshops worldwide including Italy in the summer of 2012 and France in the summer of 2013. 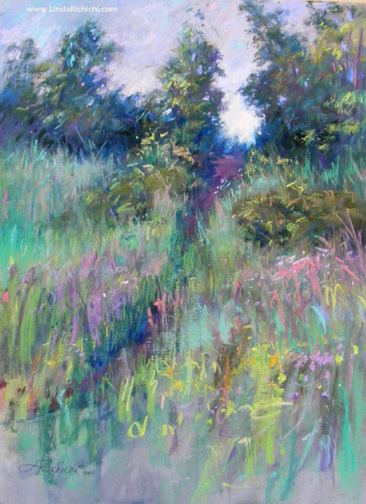 She is represented by Art Vue in Ramsey, NJ, Woodwalk Gallery in WI and Icehouse Gallery in McIntosh, FL. 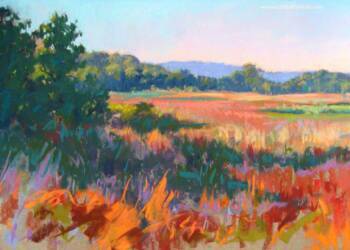 She also shows in various galleries in the Hudson Valley Region regularly. For the location of upcoming exhibits go to www.LindaRichichi.com . For me, painting is a pilgrimage — a journey into the mystery of creation and, through that sacred path, ultimately a journey into the deepest reaches of my soul. If in my painting I am successful in reaching my goal, then I see it as a bridge into you. Whether I am painting in the breathtaking Hudson Valley, near Tuscan castles, or on a sun-drenched beach in Maui, my intent is to capture the underlying brilliance — the spiritual energy — that underlies all of nature. Painting en plein air, absorbed into nature’s grand silence of communication, with all of my senses acting as ready receptors to whatever might be presented to me, seems to assist in my mission of discovery. With intuition leading the way, I avoid focusing on details to allow for a total immersion of self into the “greater” self that surrounds me. Slowly, the world of form and color merges and shifts, separates and impresses, the whole dissolving into an insistent mood of pure energy. It is this distillation of both what is seen and not seen that comes forth on my canvas. When a mixture of color and form resonates in my being, when I feel that I am at one with nature and that my painting is reflecting that union, then I feel a sense of spiritual awakening. The magic is there and the painting is complete. Golden Open Acrylic 8" x 16"